For this how-to, we'll assume that your primary domain hosted with us is called www.maindomain.com, and you want to host an additional domain called www.addon.com. 1. 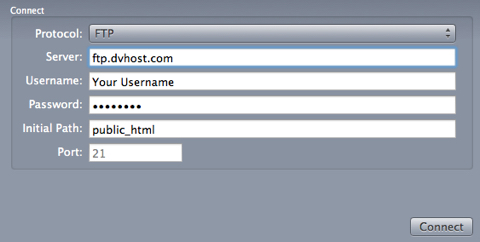 Login to the Client Area (cPanel). 2. 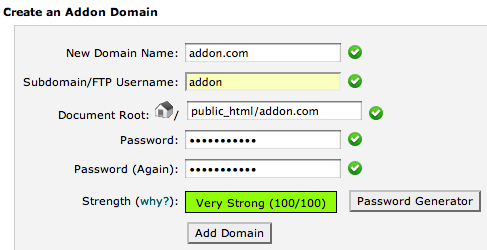 Click on "Addon Domains", which you will find under the "Domains" heading. 3. You'll see a form named "Create an Addon Domain". The only fields you need to fill out are "New Domain Name" and "Password". Also note the username that is generated, as you'll need it later for the publishing setting. User Name: [email protected] (this is made up of the username that was generated when you added the addon domain, followed by @ and your primary domain name. If you do have any problems, please contact our support team. 2. Click Test Connection to make sure your settings are correct. 3. Save your settings by clicking OK. That's it, you are ready to publish. Tip: One great feature of addon domains is that each addon domain has its own unique login information, which is firewalled from the rest of your account. That means you can safely hand it out to clients.